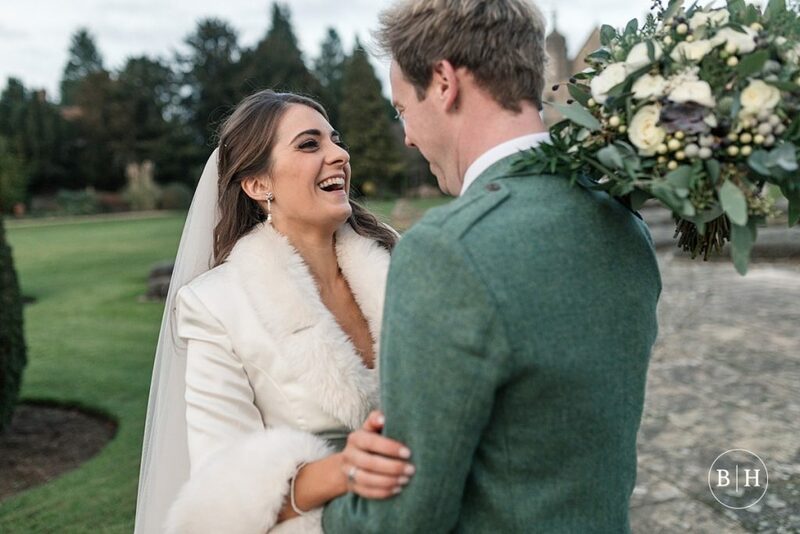 You might have seen their engagement shoot feature on the blog last week, but I wanted to feature their gorgeous wedding! 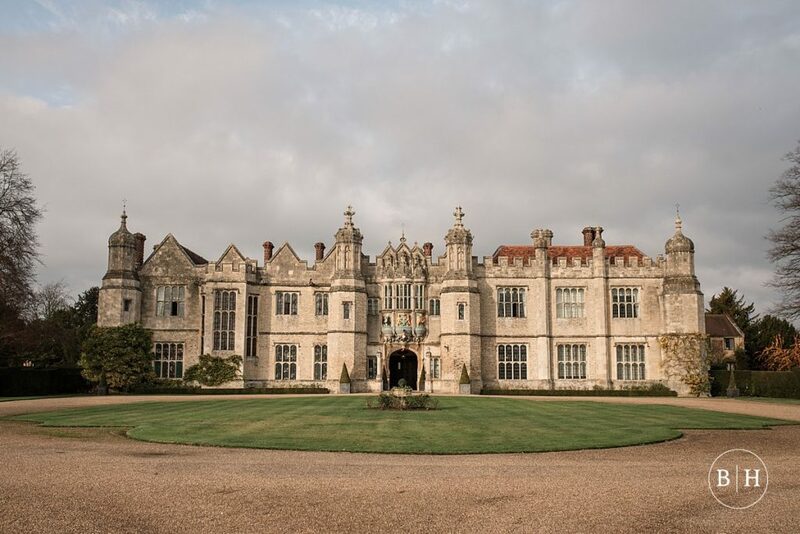 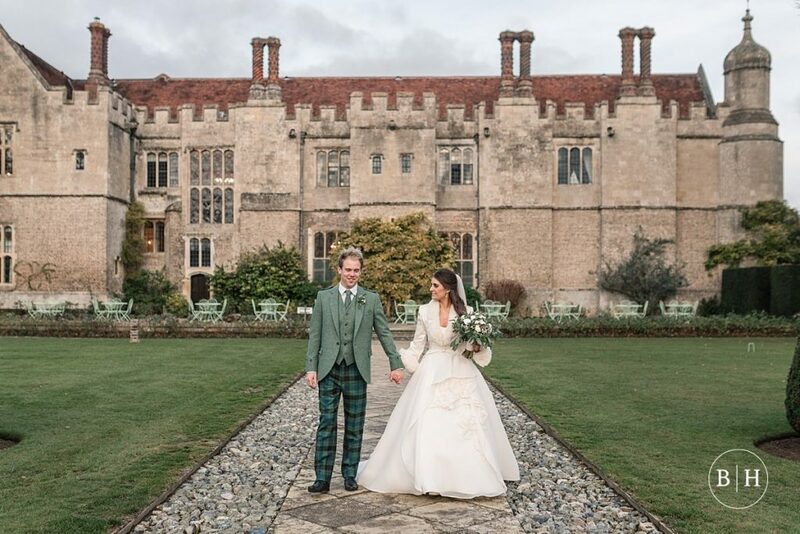 Sophia and David got married in November at the spectacular Hengrave Hall, which is a stunning Grade I listed Tudor mansion in Suffolk. 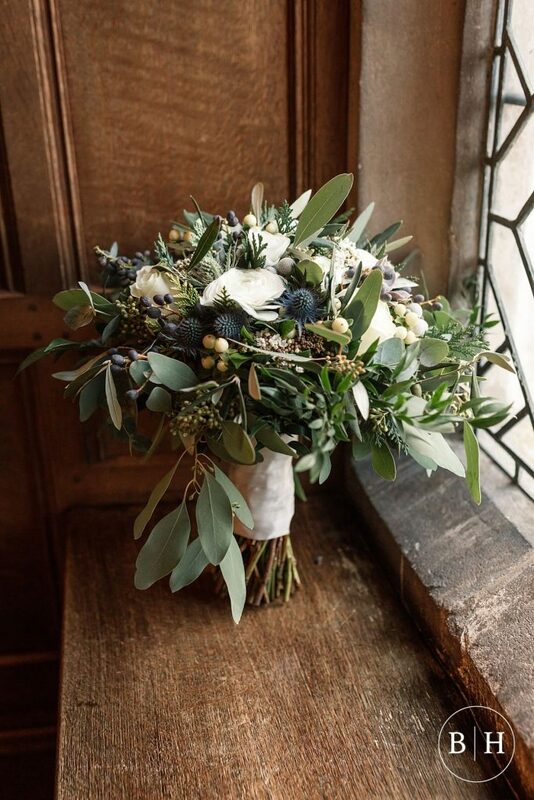 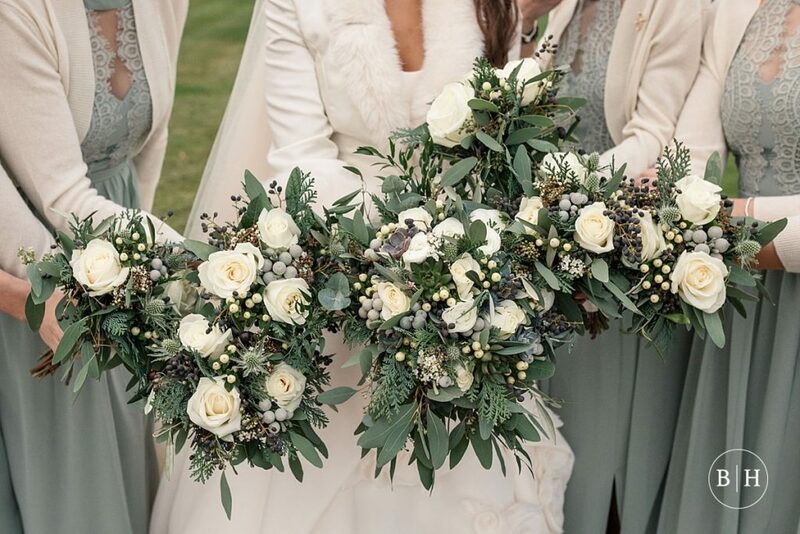 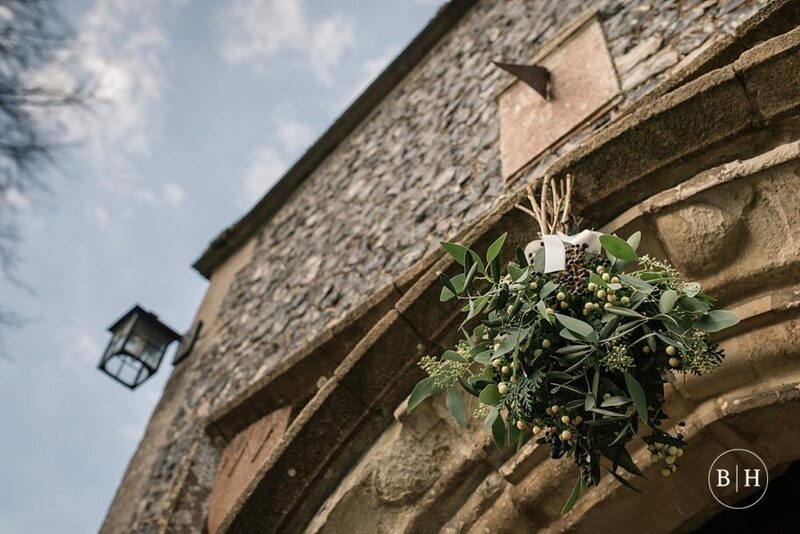 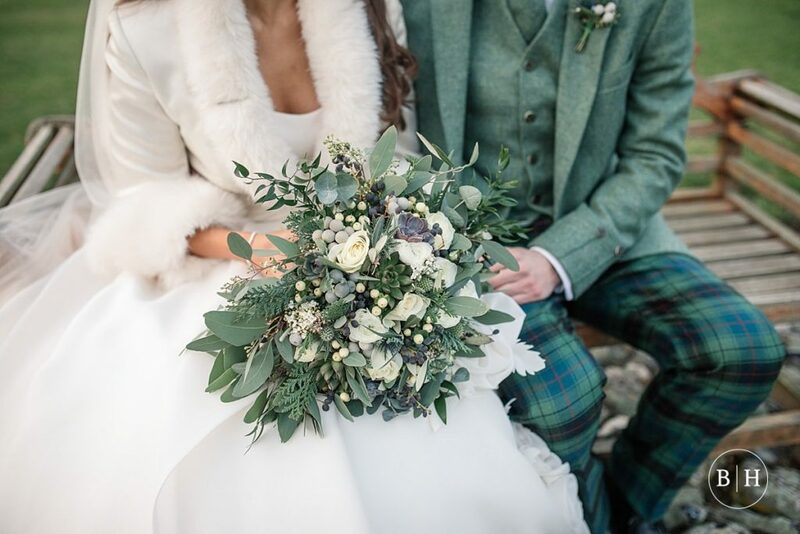 It was such a beautiful wedding with a lovely colour scheme and so many personal and handmade details – and even the weather played ball! 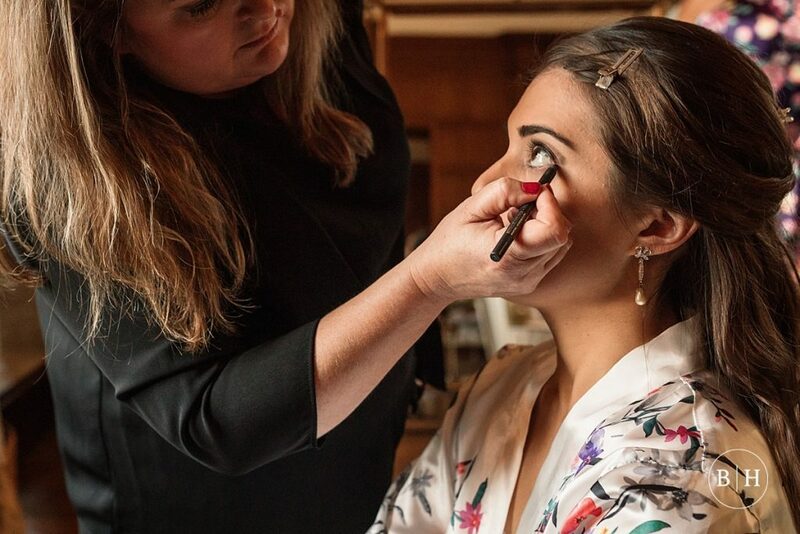 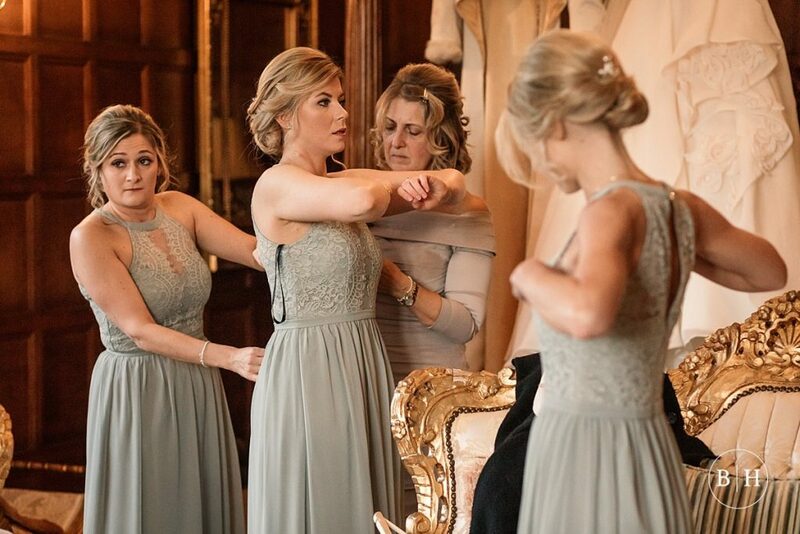 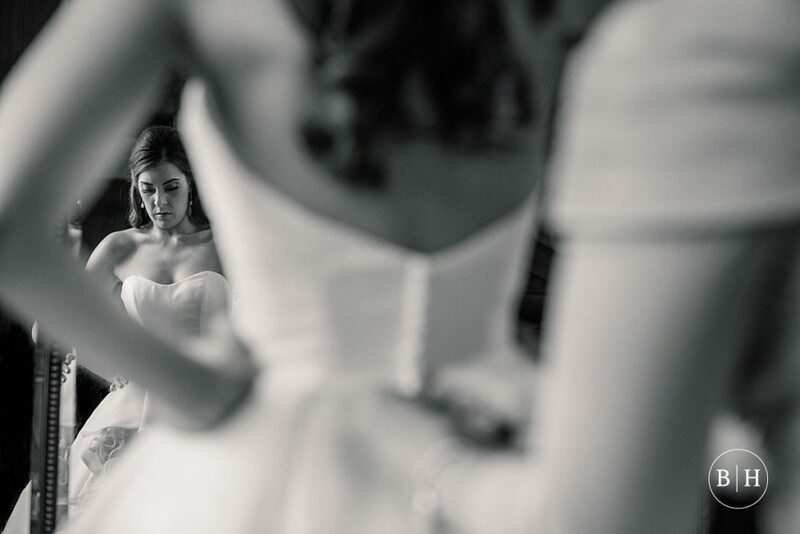 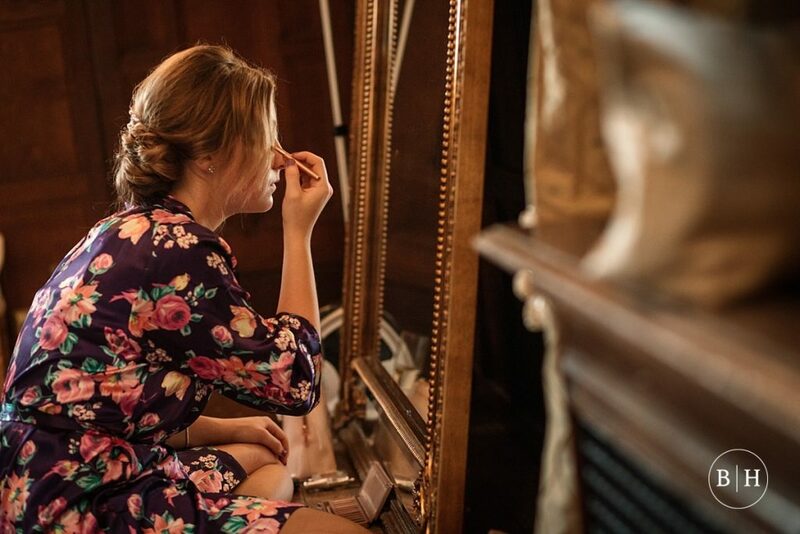 Sophia got ready in the beautiful Hengrave Hall bridal suite with her girls. 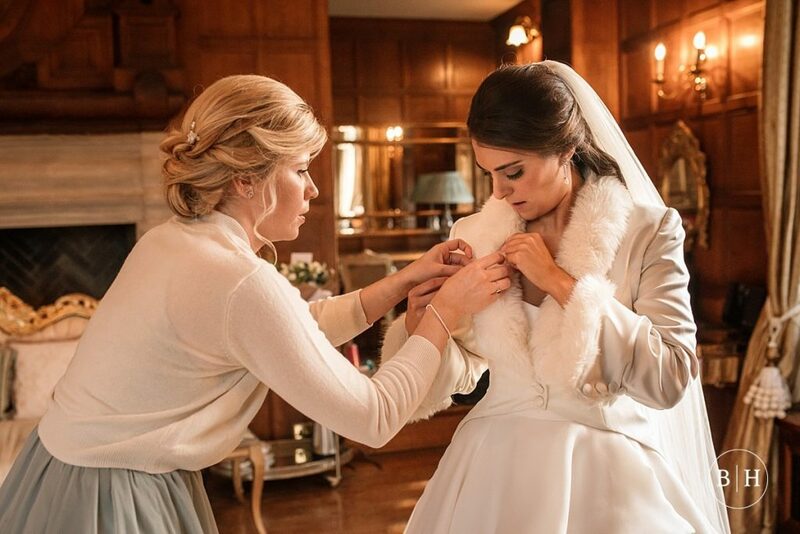 It’s a stunning opulent room, which is a really special place for the preparations! 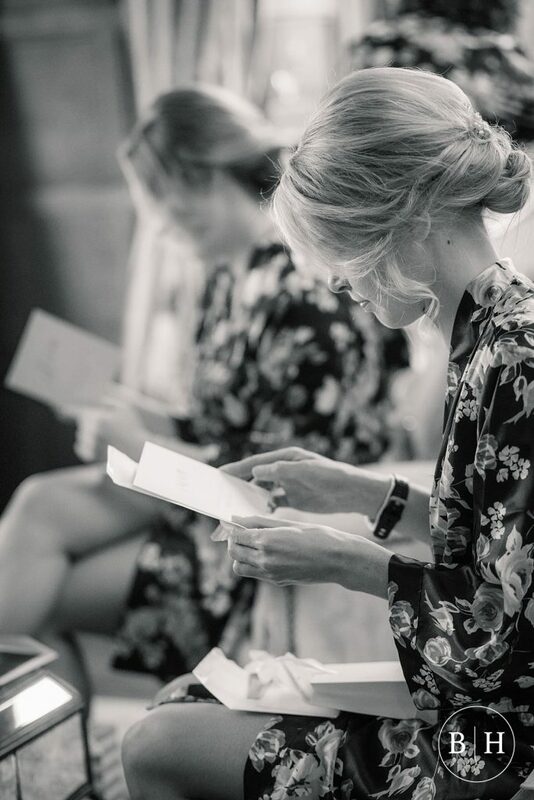 Sophia gave some beautiful gifts to her bridesmaids, along with some lovely heartfelt handwritten notes, and everyone was really emotional. 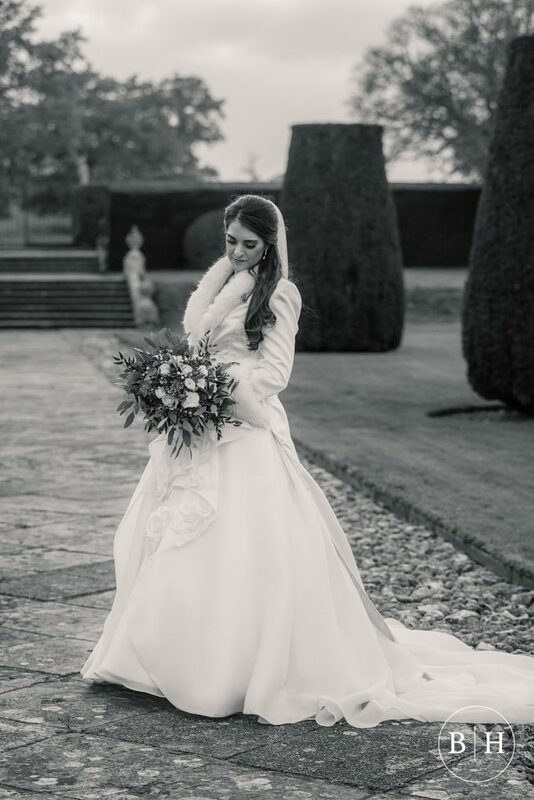 After an emotional ‘first look’ from her Dad, and once everyone was ready, they then made their way outside and walked the short distance to get to the ceremony. 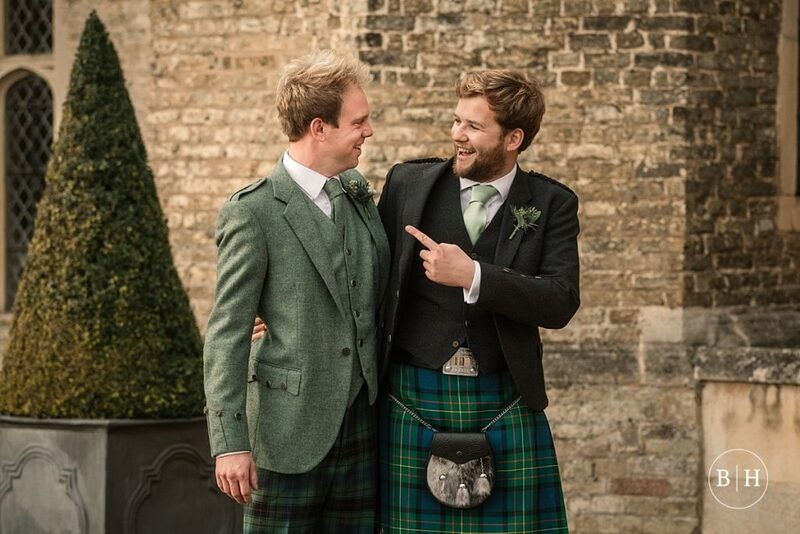 David got ready in the ‘Blue Room’ at Hengrave Hall with his groomsmen (all resplendent in kilts). 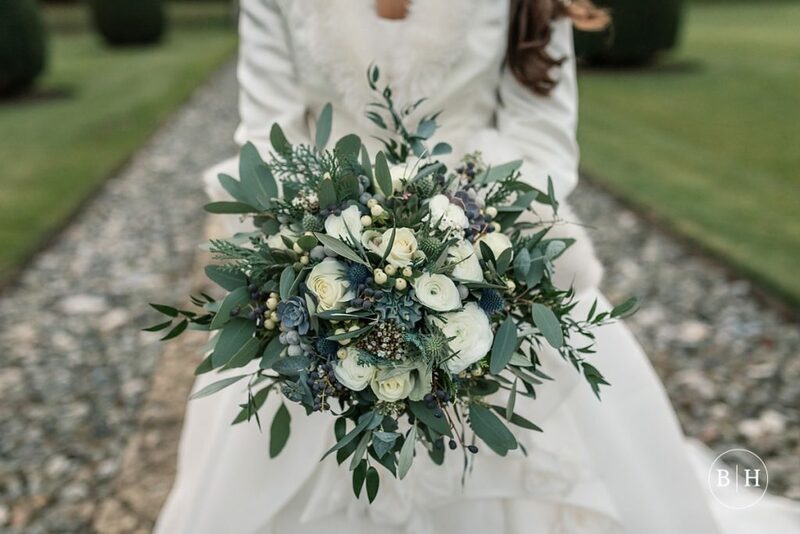 Because of the proximity of the bridal suite and the Blue Room, I was able to pop in for a few shots with the boys too – something that’s normally only possible with a second photographer. 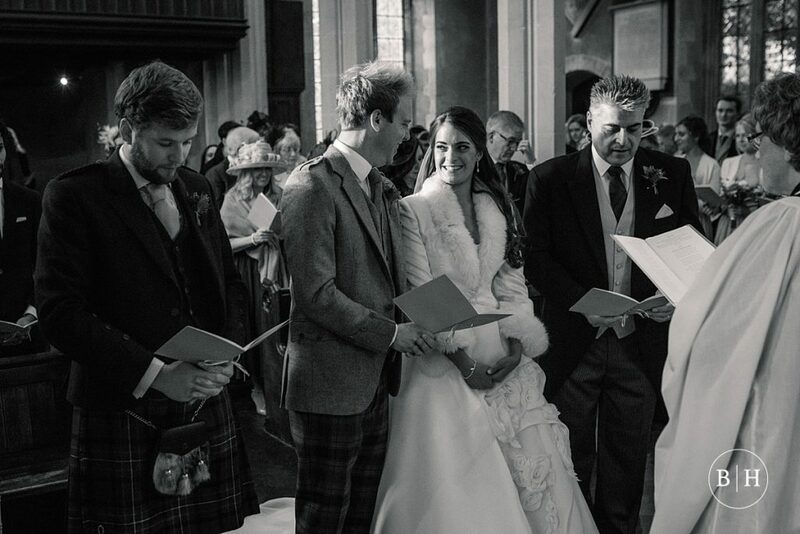 The ceremony was a lovely blessing in the stunning church nestled next to the grand house. 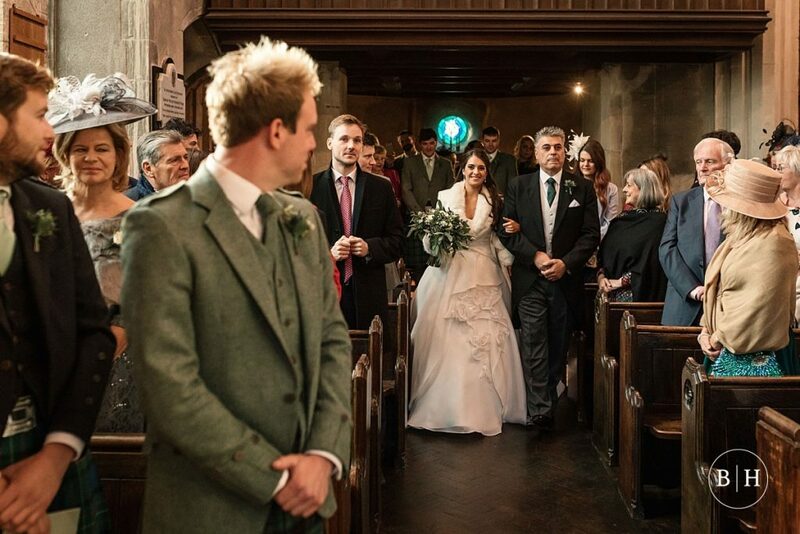 The church was filled with beautiful natural light (which can be a rarity for a church!) 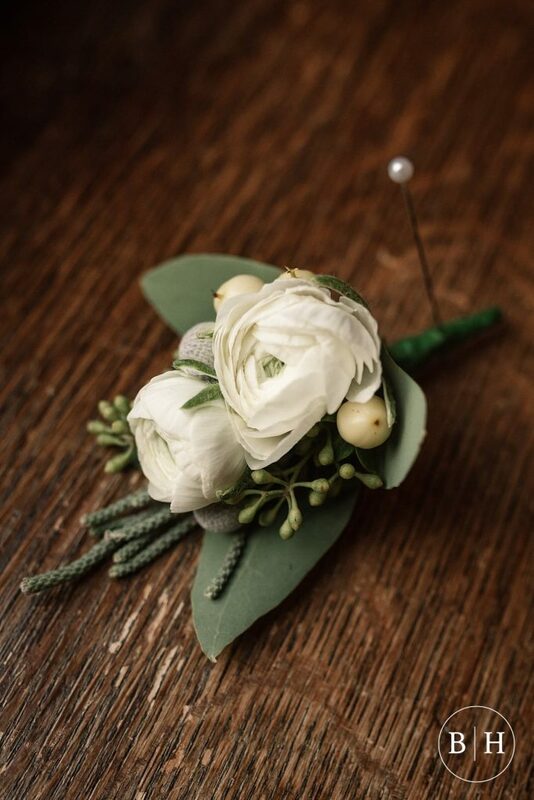 which was complemented with soft candlelight to give an intimate wintery feel. 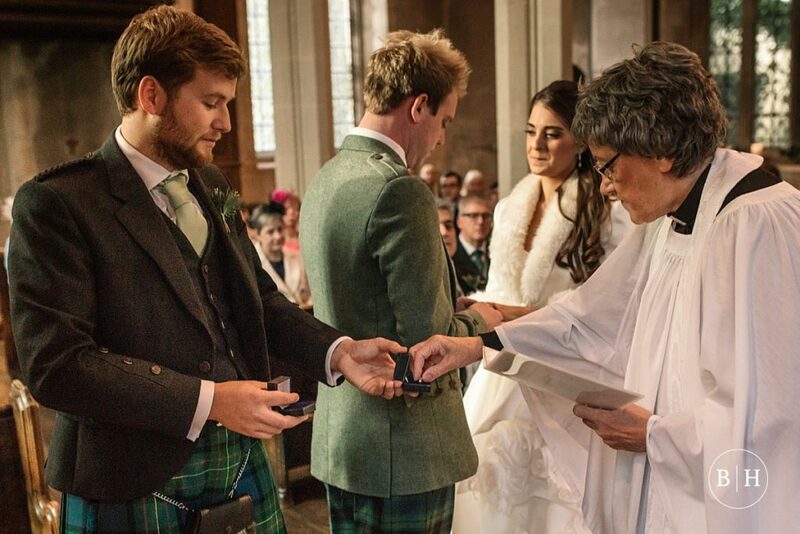 During the ceremony they had several beautiful readings from friends and family. 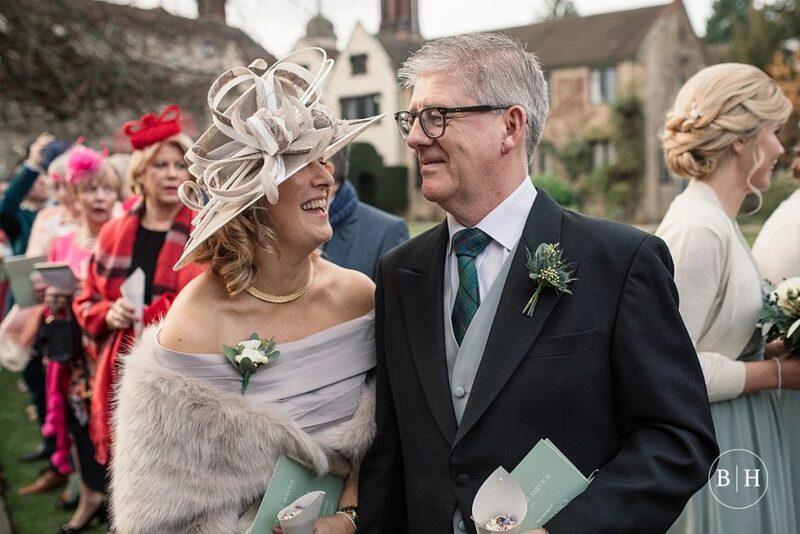 It was a lovely service and a wonderful celebration the couple’s loved ones. 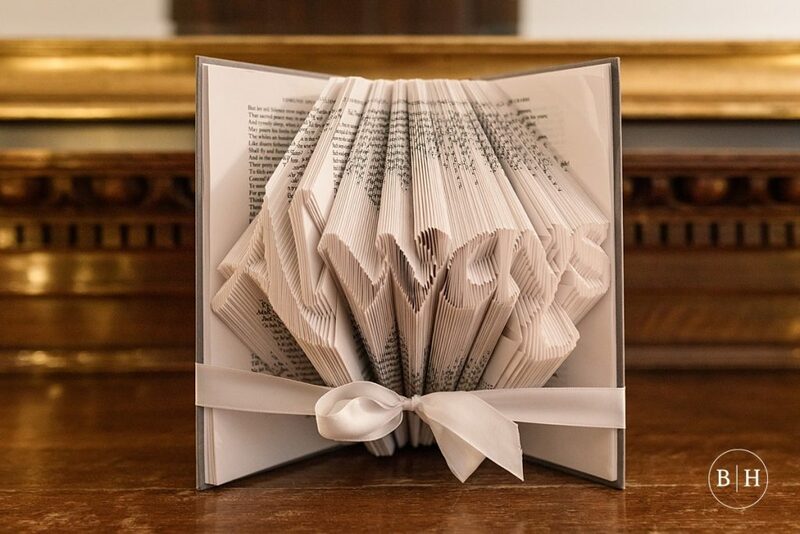 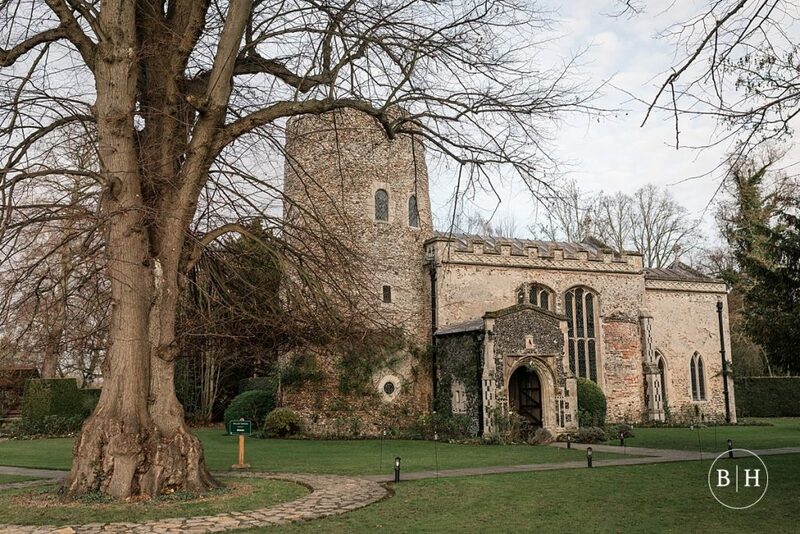 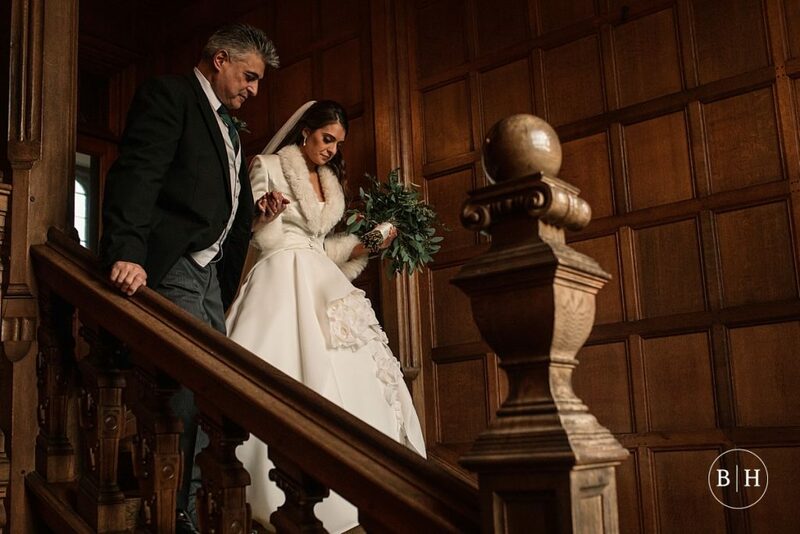 Sophia and David had formalised their marriage first thing in the morning in the Library at Hengrave Hall, but counted the blessing as the ‘real wedding’. 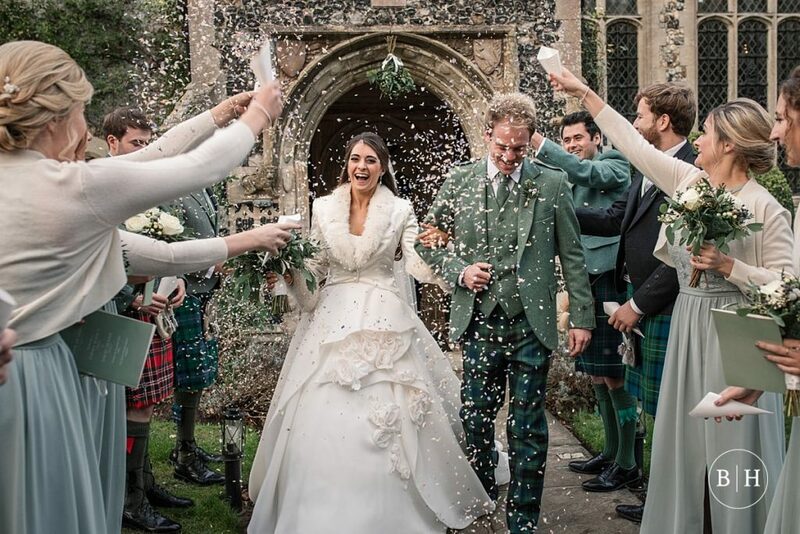 Once the ceremony reached it’s conclusion, Sophia and David made their way out into the chilly winter’s air to be showered in confetti by their guests – always one of my favourite moments at any wedding! 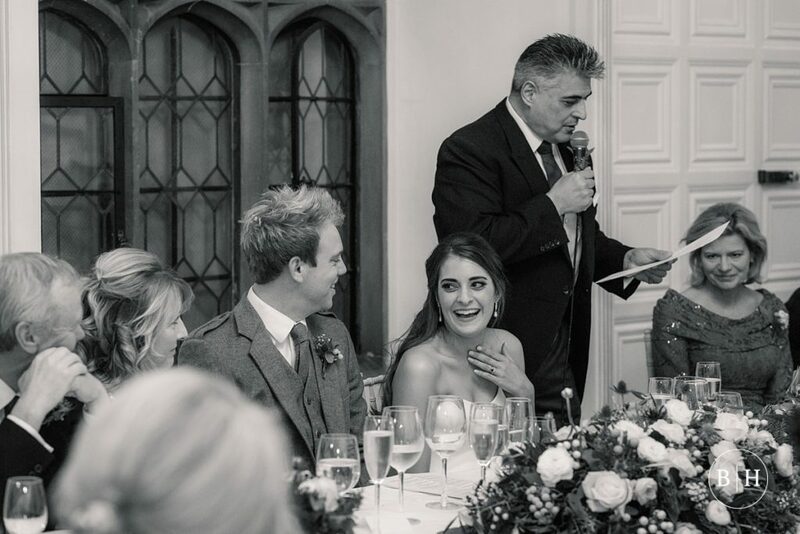 It was a wintery wedding, so everyone kept cosy indoors in the Dining Room during the drinks reception. 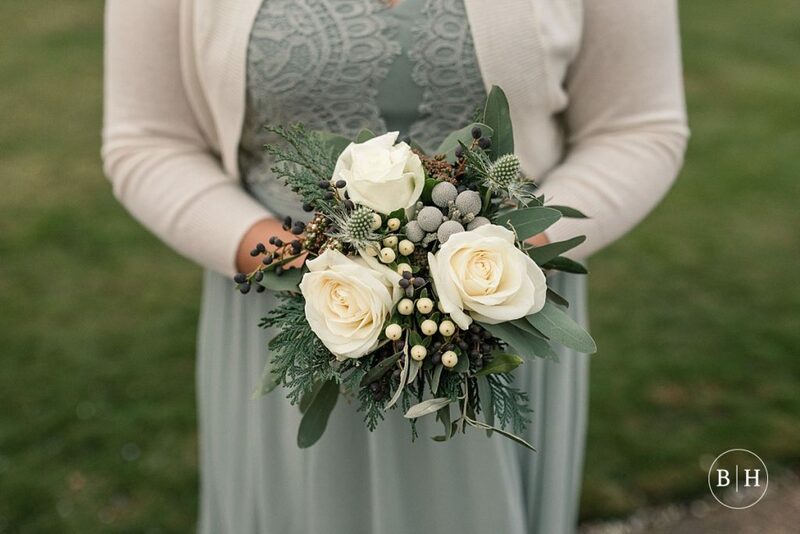 There were so many nice touches around the venue, like the flowers, candlelight and brilliant handmade book-fold decorations. 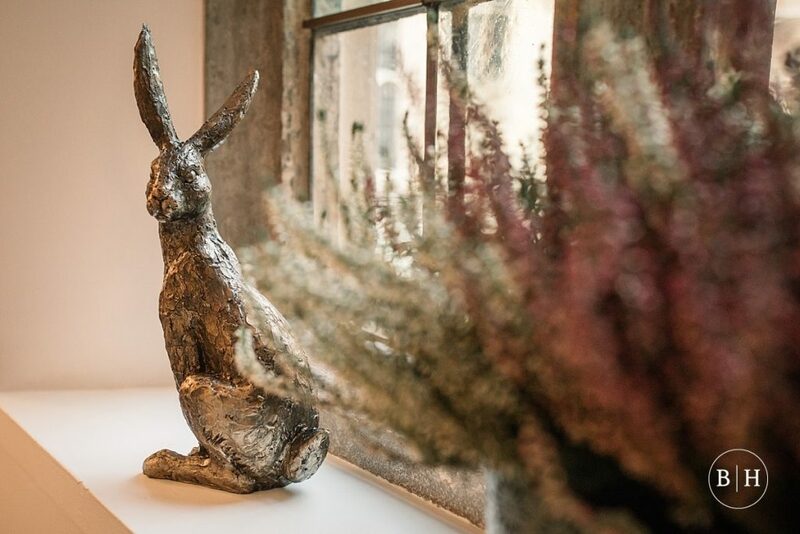 Sophia and David also decorated the venue with copper animal statues, because they live on a farm, and wanted to bring some elements of that to the day. 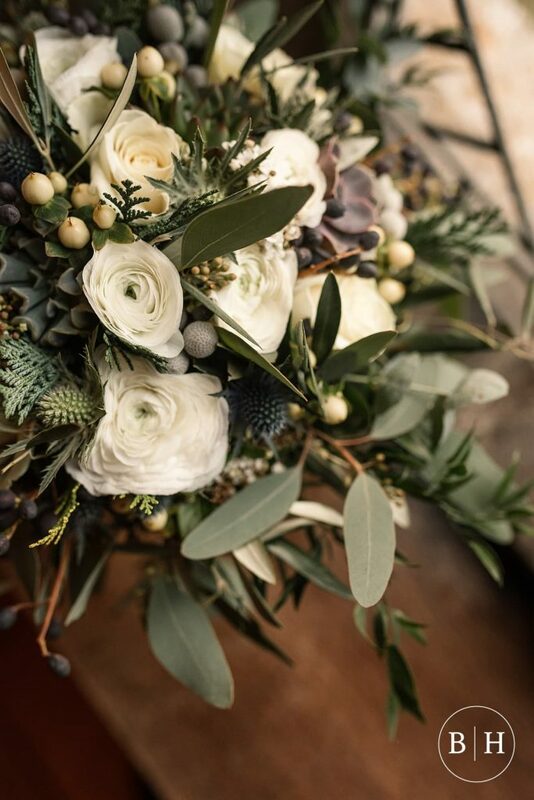 I loved these personal touches and you could tell how much effort and thought had gone into how everything looked, it was beautiful. 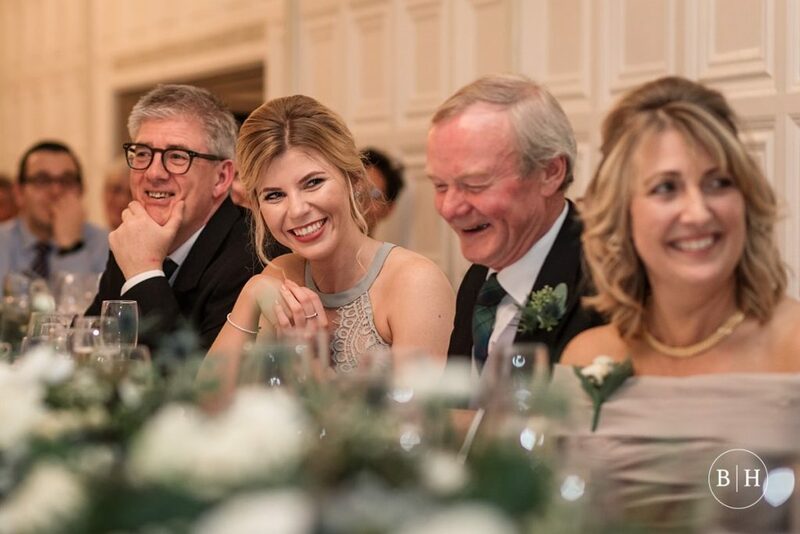 The evening meal took place in the Long Gallery at the venue. 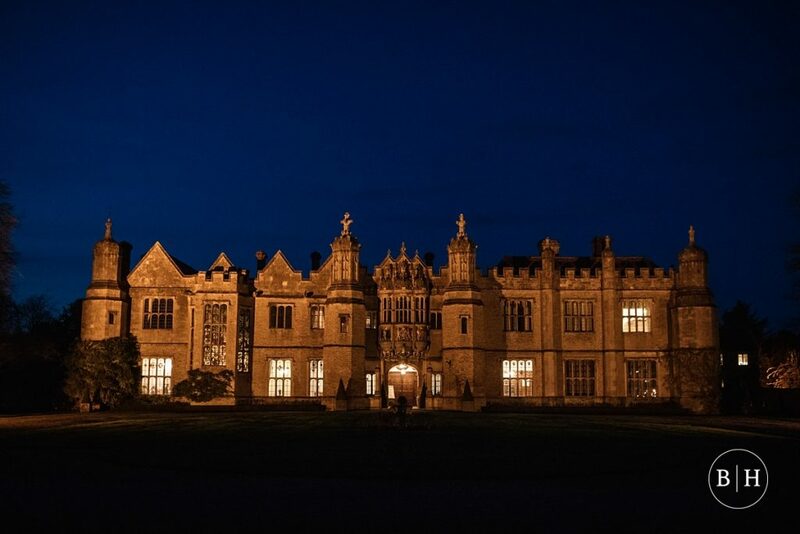 For dinner they had a delicious meal, which was enjoyed by all the guests. 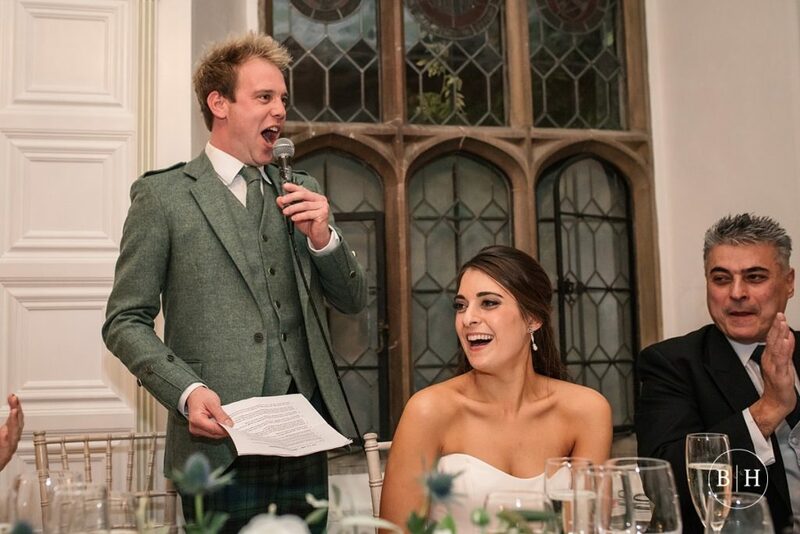 One of the most memorable parts of the day was the speeches, because they were so funny. 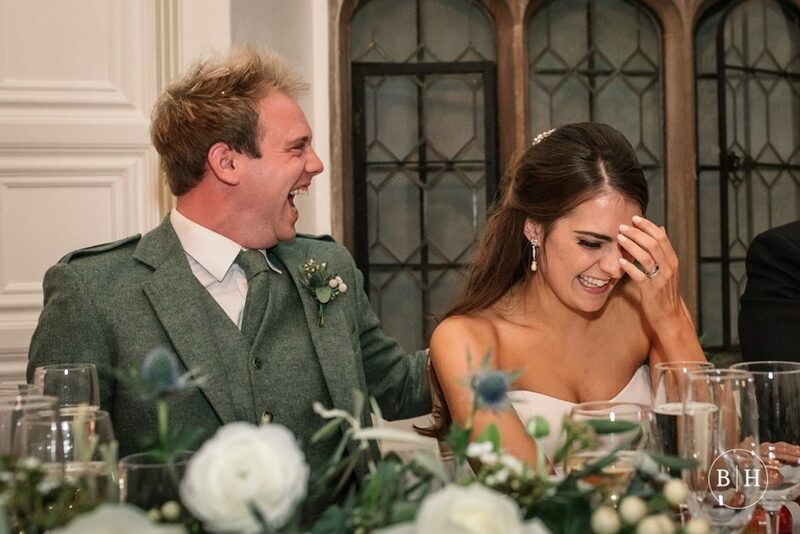 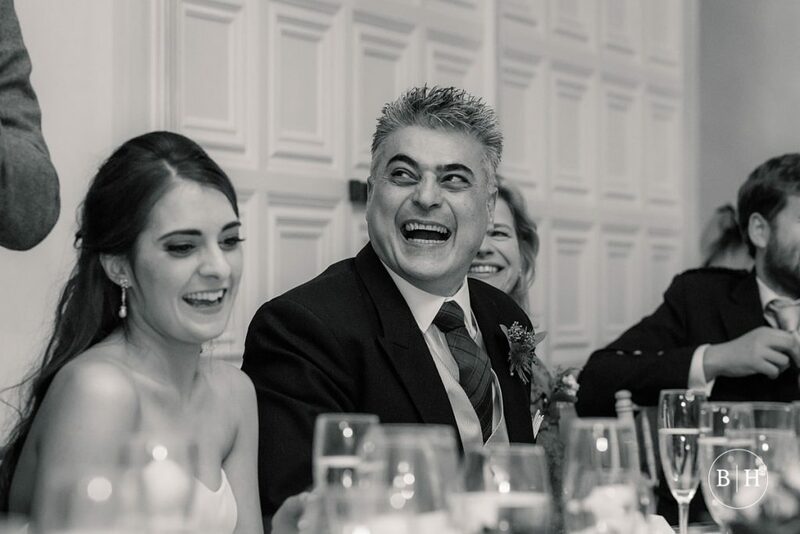 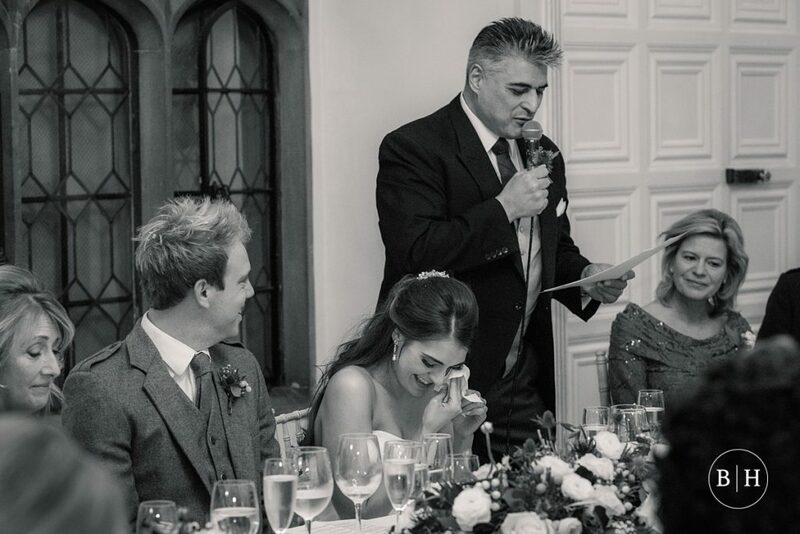 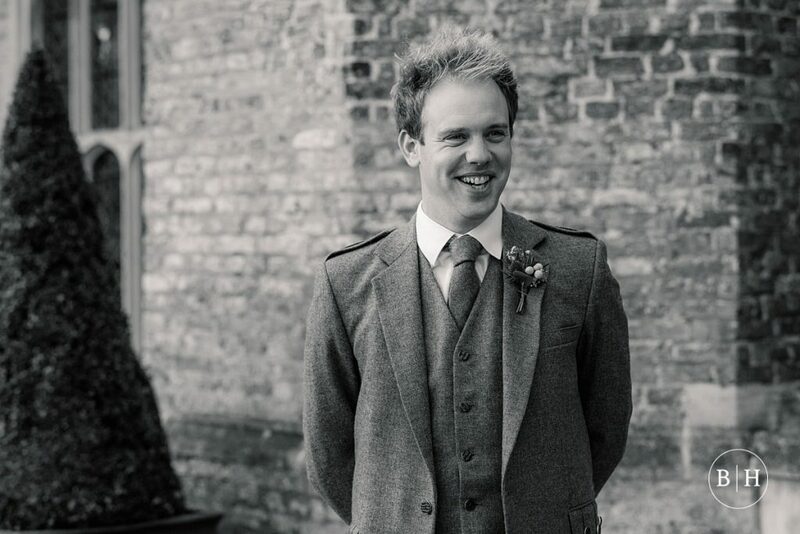 I love to hear the speeches at weddings, I always get to know my couples quite well before the day, but the speeches usually bring out one or two amusing things I didn’t know! 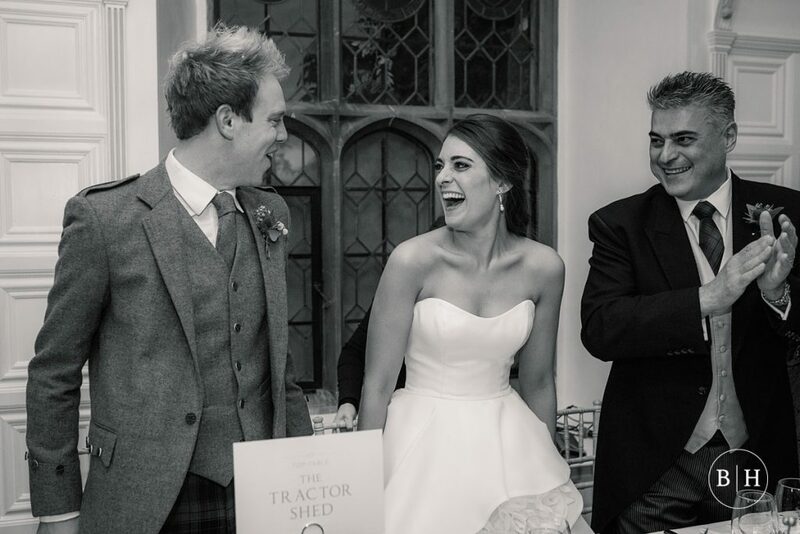 After the speeches and cutting of the cake (which had lovely silhouettes of the couple and their dog, Joules, as well as a tractor! 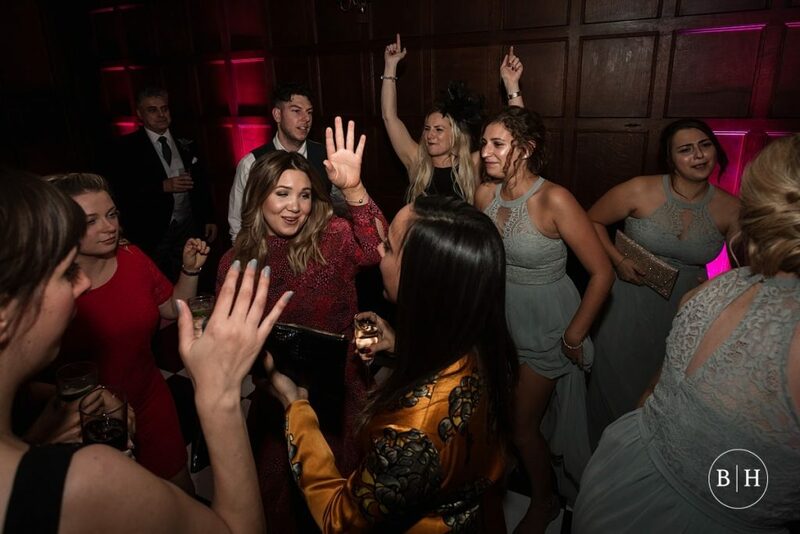 ), it was party time! 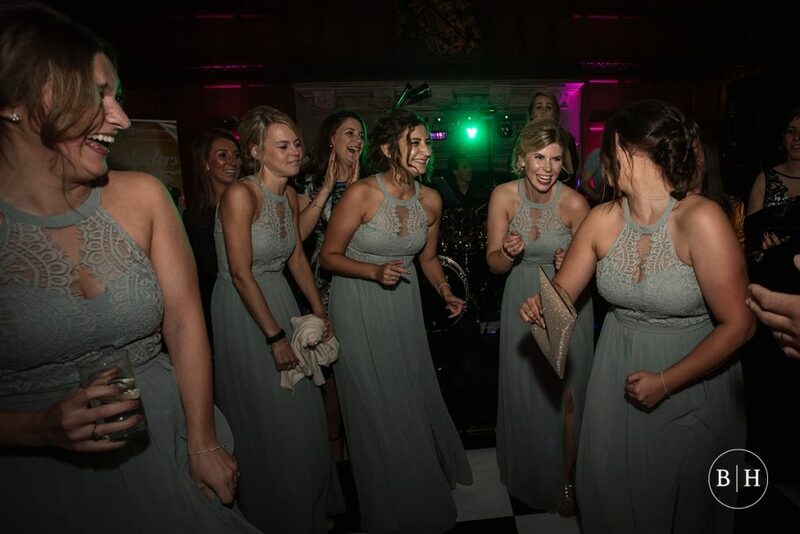 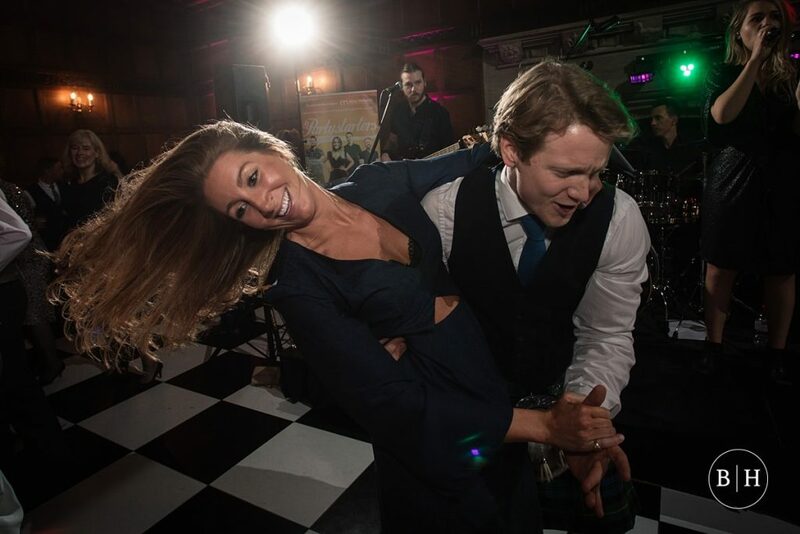 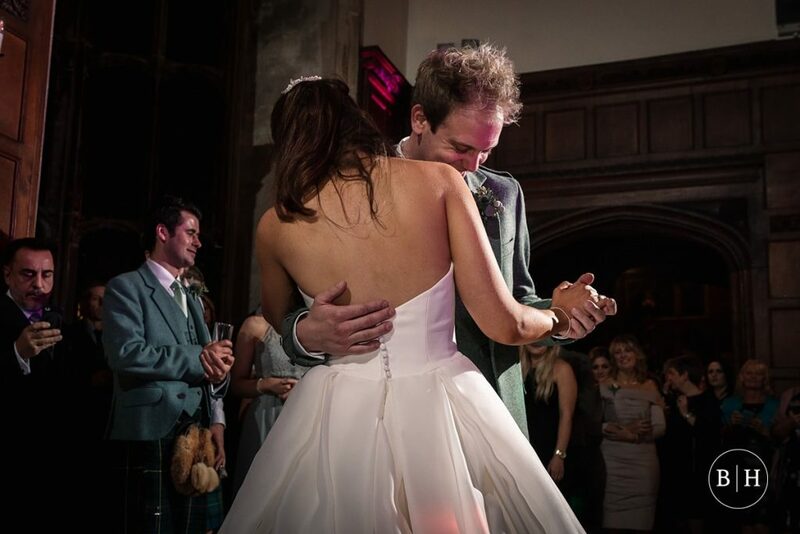 There was a live band to top off the evening celebrations, and the first dance was to a personal favourite of mine – Songbird by Fleetwood Mac (I actually walked down the aisle to this song!). 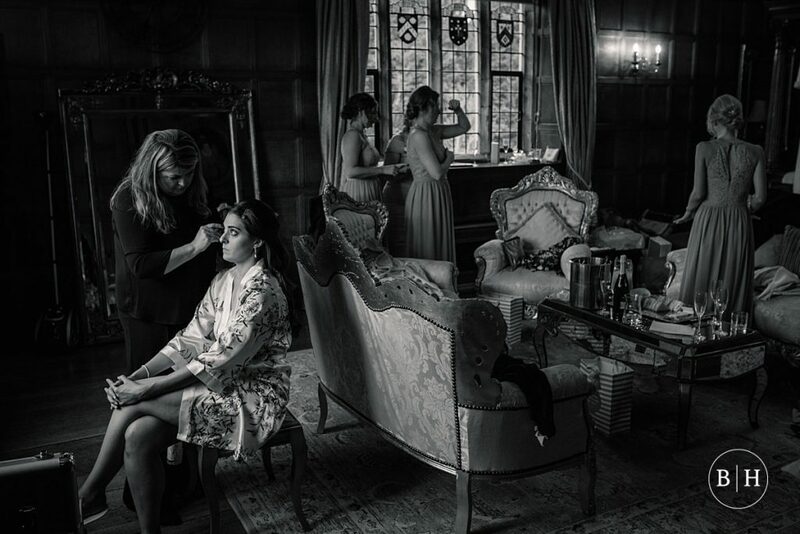 I love shooting Hengrave Hall weddings because the history of the building is amazing – just walking around the halls, you can really sense it. 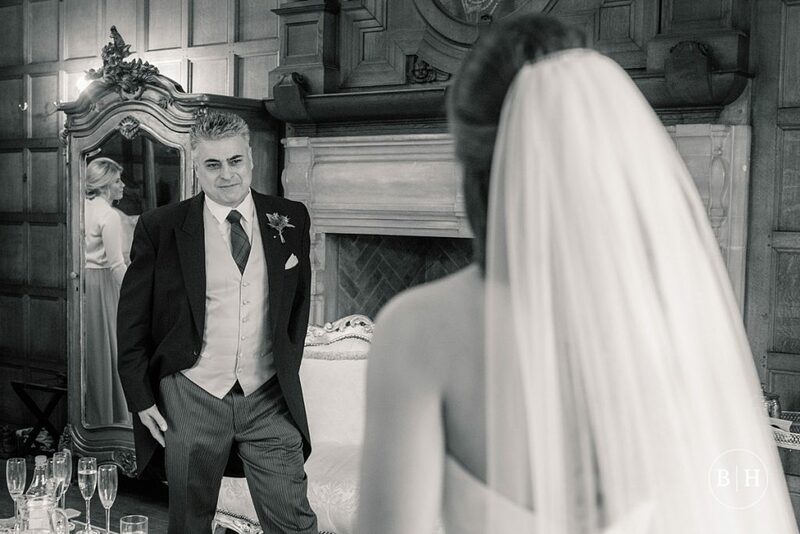 It’s such a wonderful space to get married, with gorgeous rooms to celebrate every part of your day. 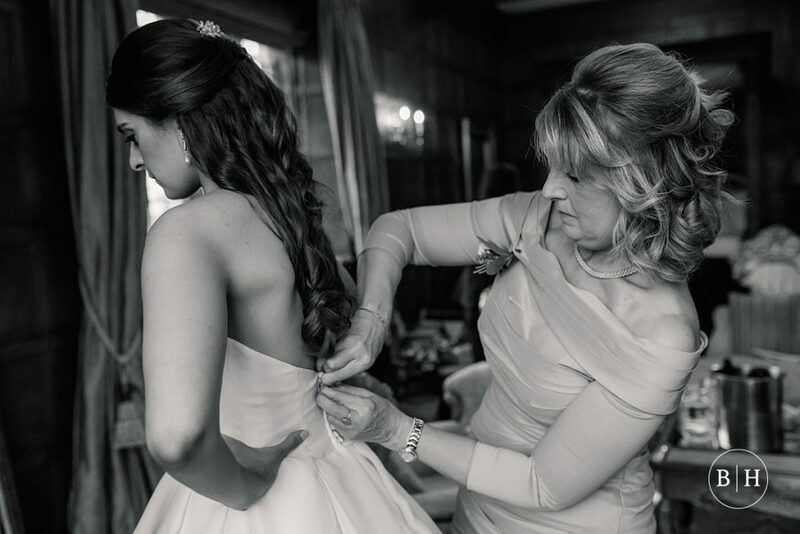 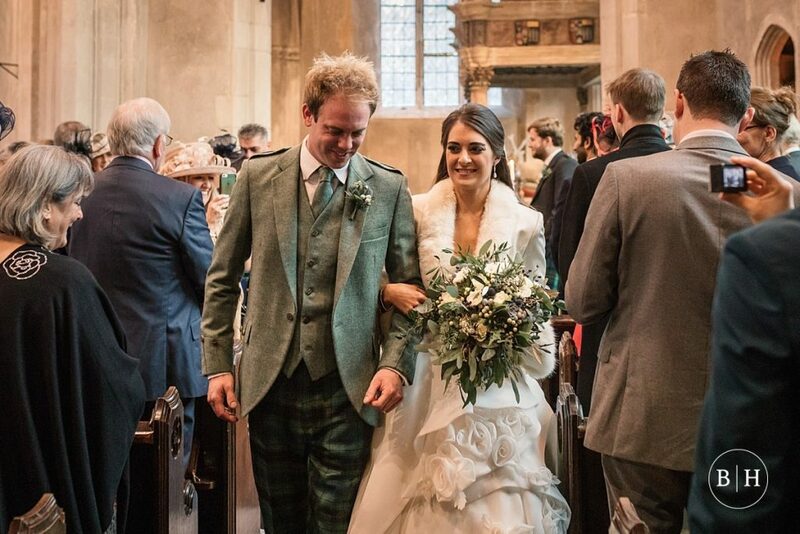 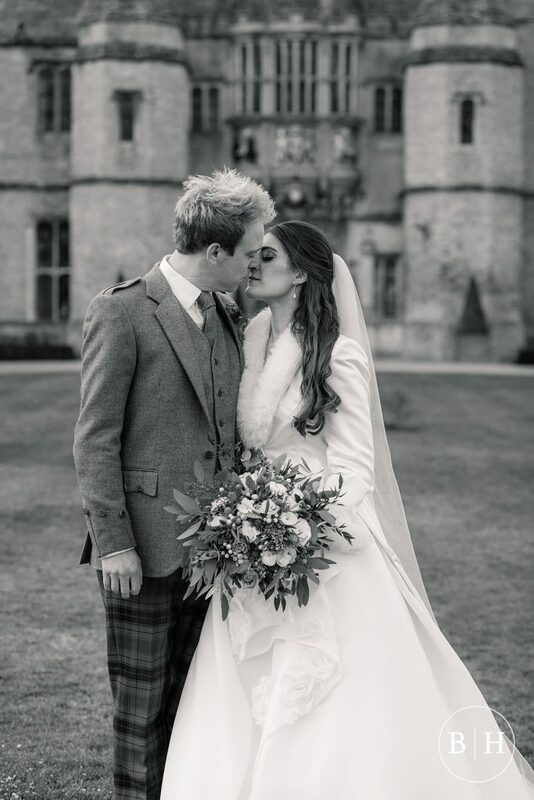 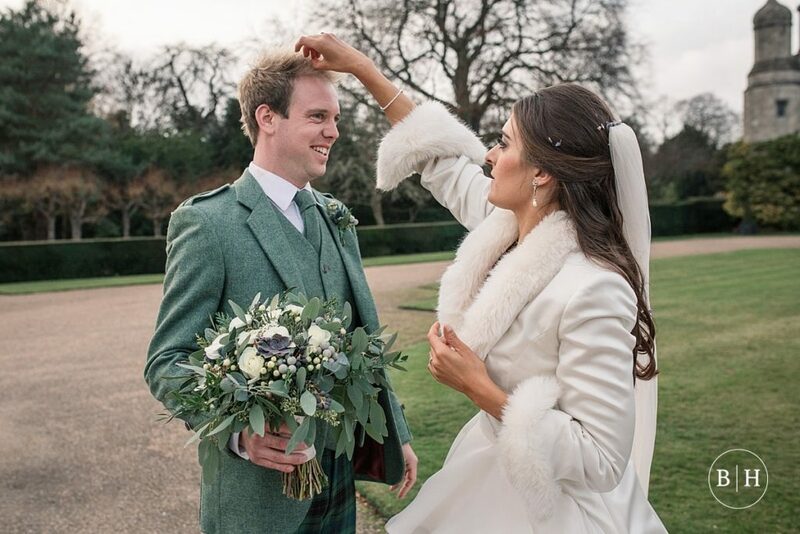 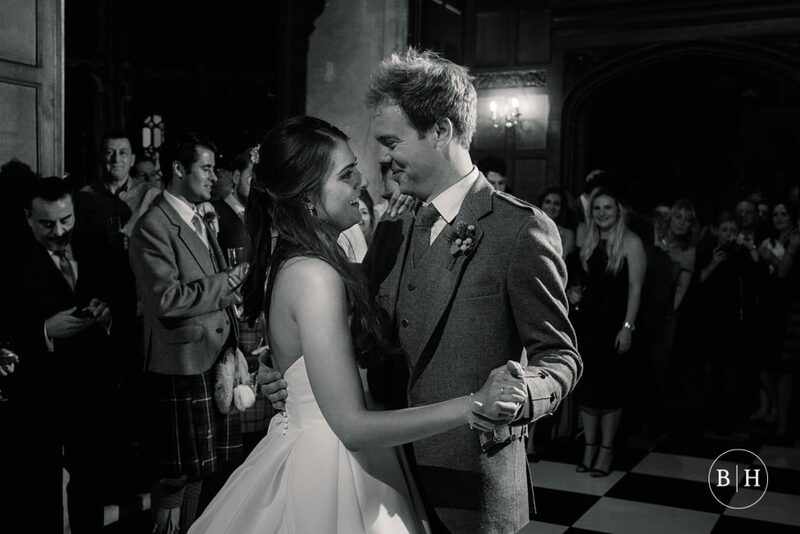 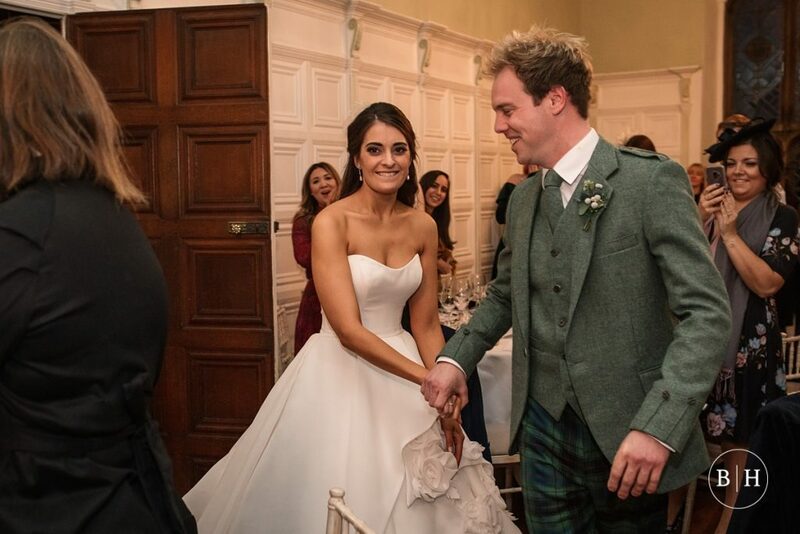 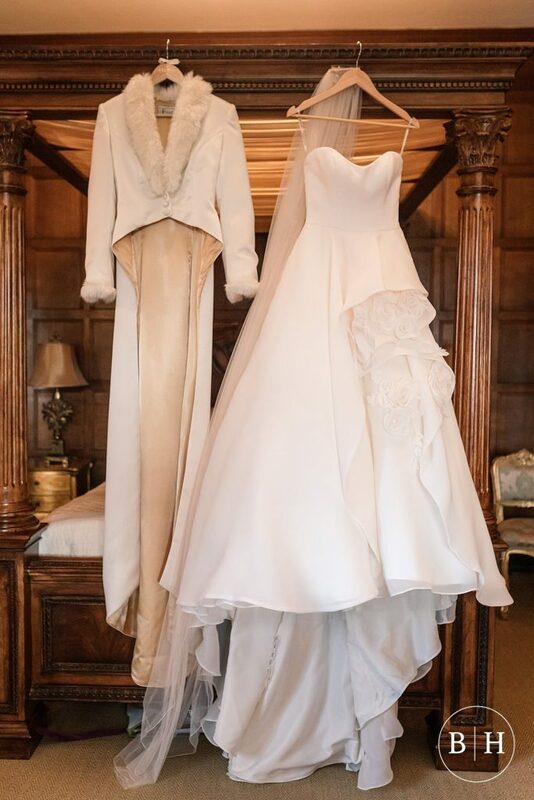 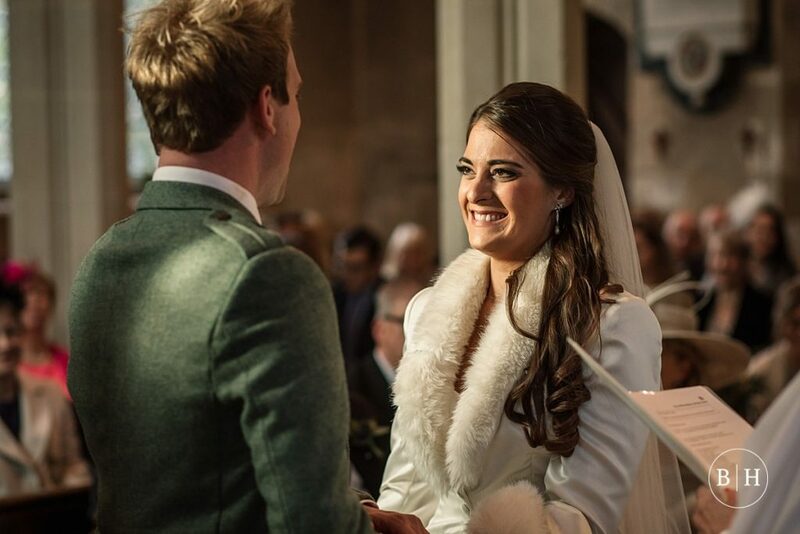 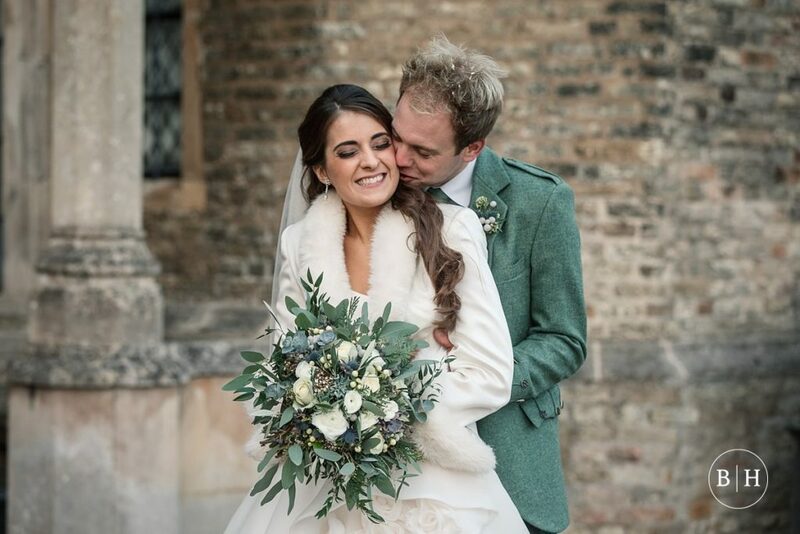 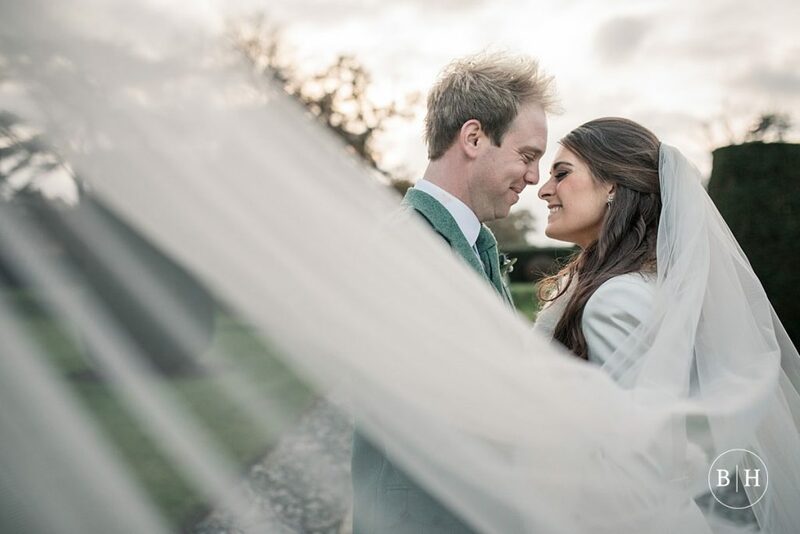 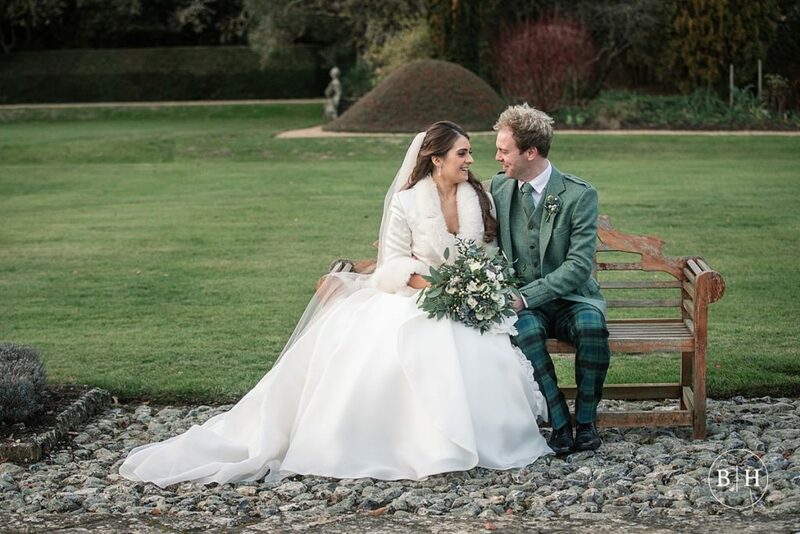 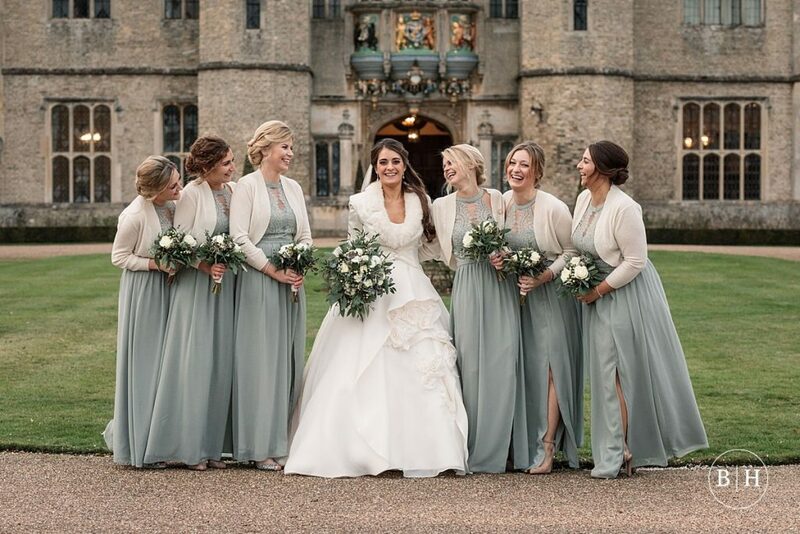 Sophia wore a stunning Maggie Sottero gown with a gorgeous bridal coat to keep her warm, accessorised with a brooch which was given to her in the morning as a wedding gift from David. 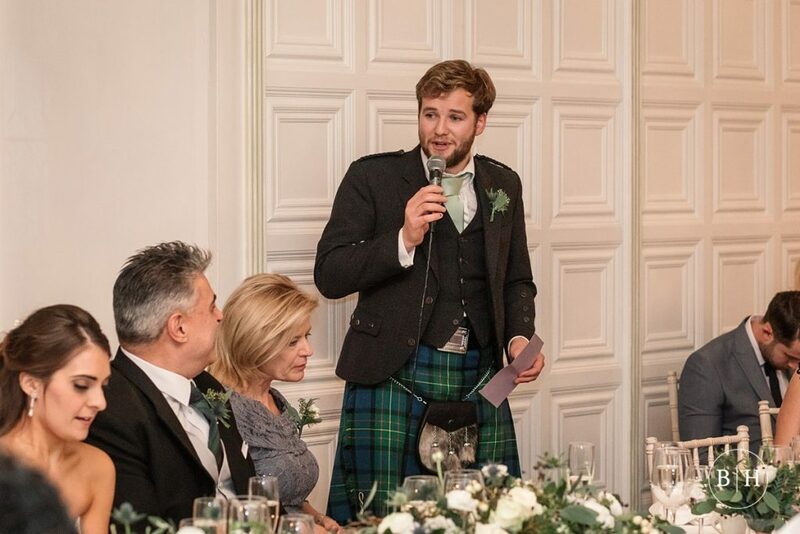 All David’s groomsmen wore kilts, but as he is not Scottish himself, David opted for a bespoke suit with tartan trousers which I thought looked fantastic. 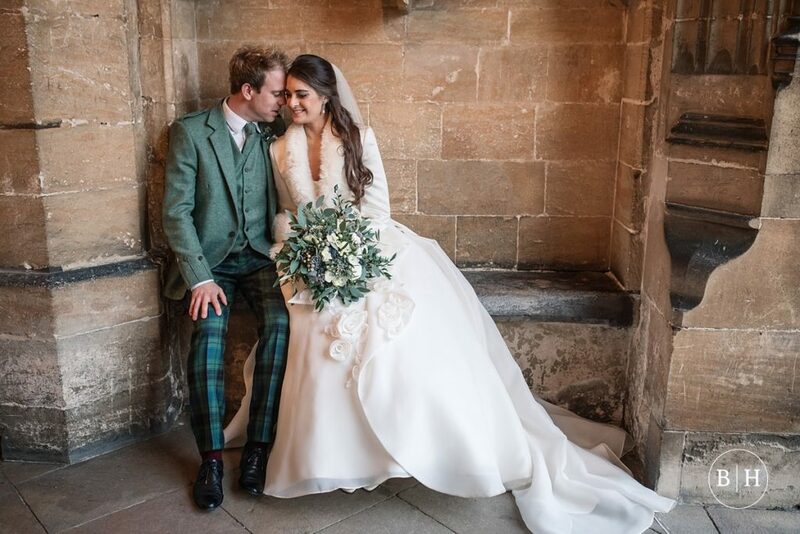 The couple looked so amazing together! 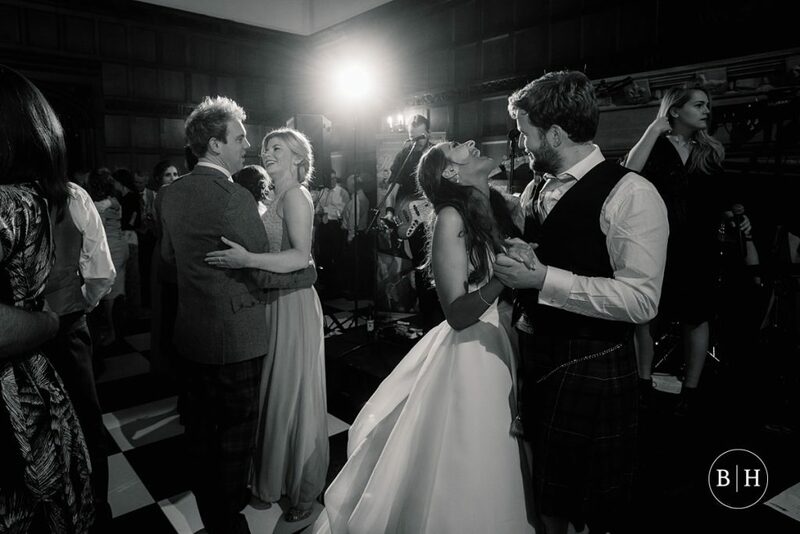 Sophia and David’s wedding had such a fun atmosphere and just the happiest occasion. 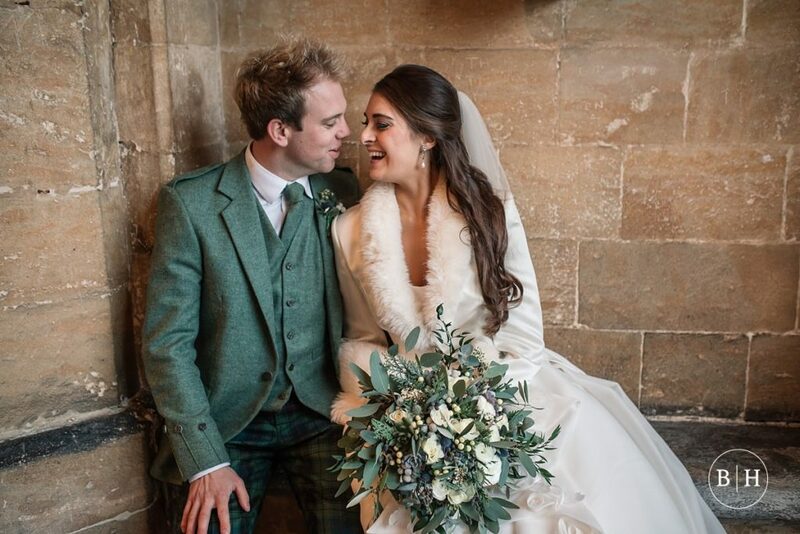 Here’s their wonderful wedding! 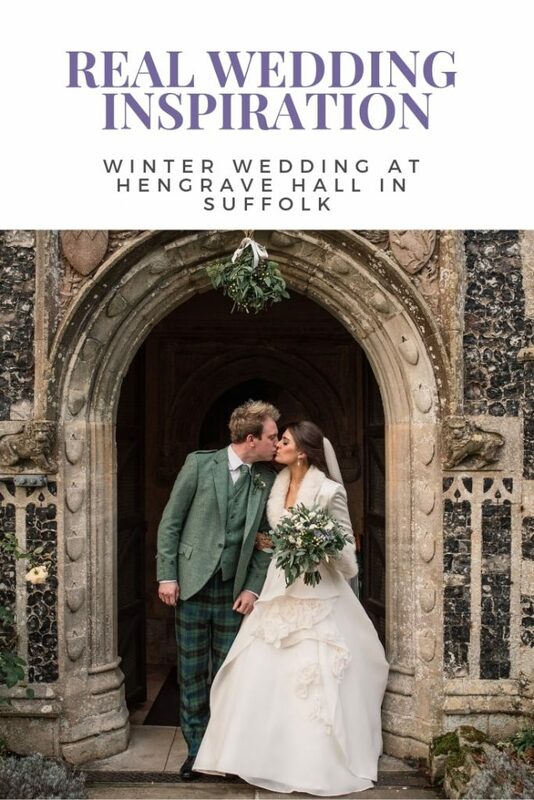 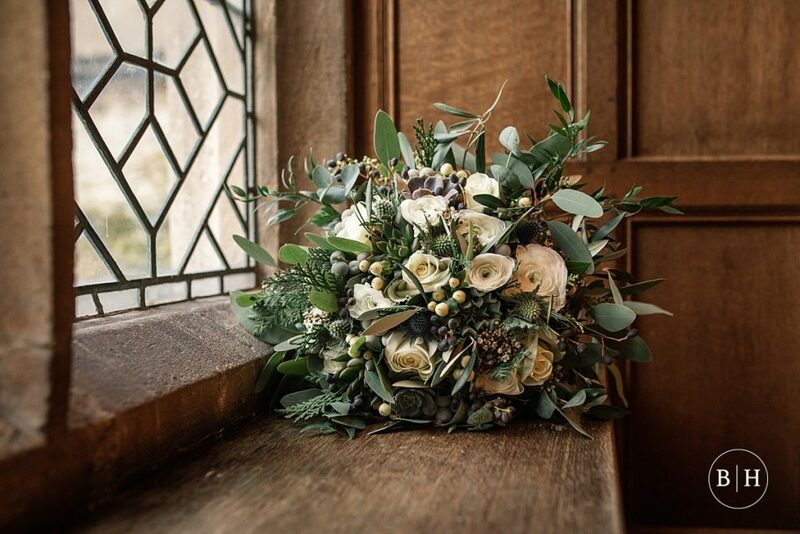 If you’re planning a Hengrave Hall wedding, I would love to hear from you, so please do get in touch!